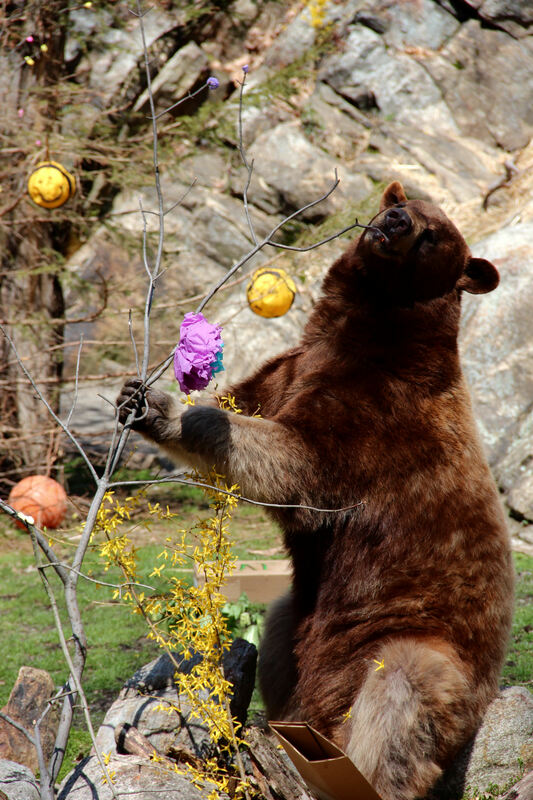 On April 26th Bear Mountain State Park, in Orange County, held a very special Earth Day celebration for its two bears. The bear enclosure was thoroughly decorated with a farmer’s market theme, including copious peanut-butter treats prepared by zoo visitors for the bears to enjoy. The bears had a great time searching for hidden snacks and exploring their beautified habitat. 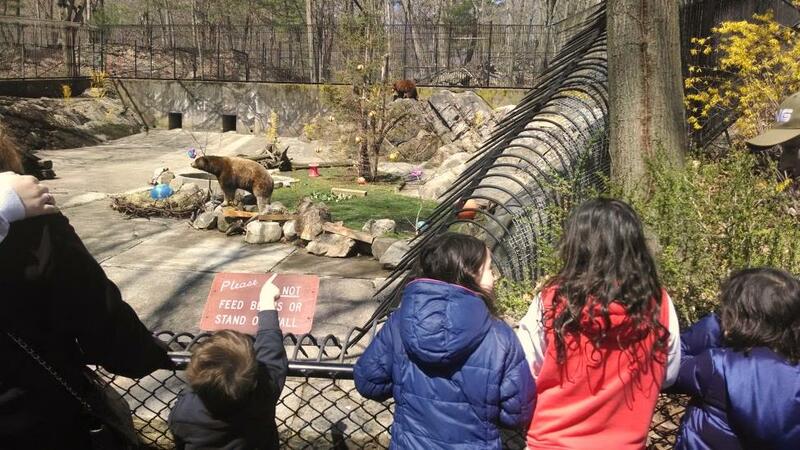 Following the festivities at the Bear Den, visitors explored a variety of other fun activities throughout the zoo. Children made fish prints, nature jewelry, and insect crafts. There were also opportunities to learn about shells, invasive species, birds, biofacts, alternative energy, native trees, and composting. Entertainment included live music and story time. Visitors also learned about ways to volunteer and take action for the environment in our local community. 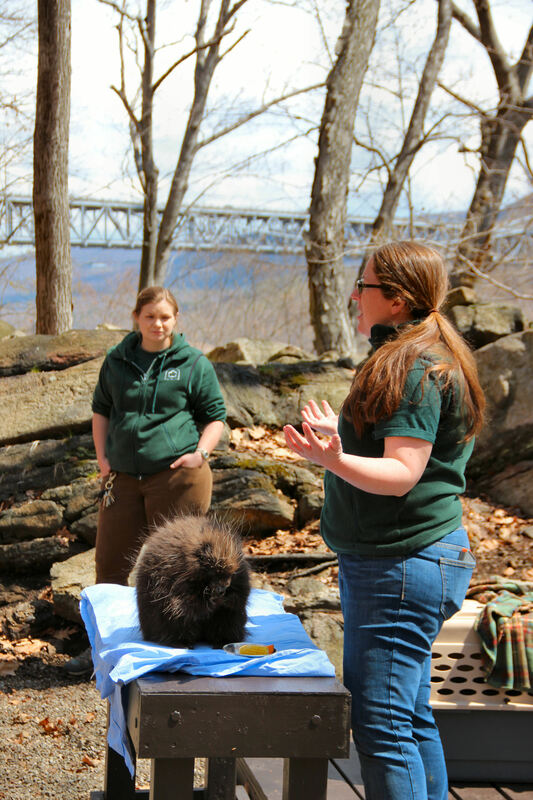 Finally, everyone had a chance to meet Trailside’s resident porcupine, Fanny, in a live animal presentation in the amphitheater. The entire day was a treat for humans and animals alike. If you missed the Earth Day Celebration, come join in the fun at Trailside’s Summer Celebration on Saturday, June 28, 2014. At Summer Celebration you can plant your own sunflower, learn about the summer season, and enjoy wildlife-related crafts. Learn about Trailside’s upcoming events at www.trailsidezoo.org. Are You Ready for I Love My Parks Day? Fans of NY State Parks are all geared up for the 2014 I Love My Parks Day, but this year State Parks, with help from the New York Natural Heritage Program, will also be running the 2nd annual Bioblitz. A BioBlitz is a time-limited survey of the number and types of species that live in a given area. On “I Love My Park Day,” scientific professionals and experts will take part in BioBlitzes at Minnewaska State Park Preserve and Clark Reservation State Park. Over a 24-hour period, our experts will document as many species, communities and habitats as possible while focusing their efforts on rare plants, animals, and ecological communities in the parks. Spring is here and you know what that means! The birds are coming back in force and they are all looking for places to build a sturdy nest. 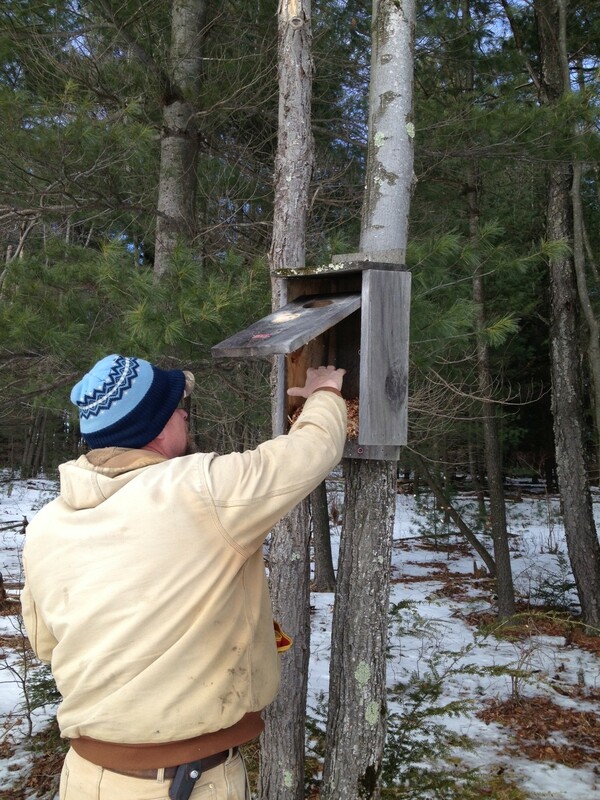 One of the ways Grafton Lakes State Park helps our feathered friends is by providing pre-fab nest boxes. The two targeted audiences are the wood ducks and bluebirds, although other birds take advantage of the boxes as well. Wood ducks and bluebirds have each suffered population declines in the recent past, partially due to human interference. By providing these special nesting boxes, we can help bring the populations back up to snuff! 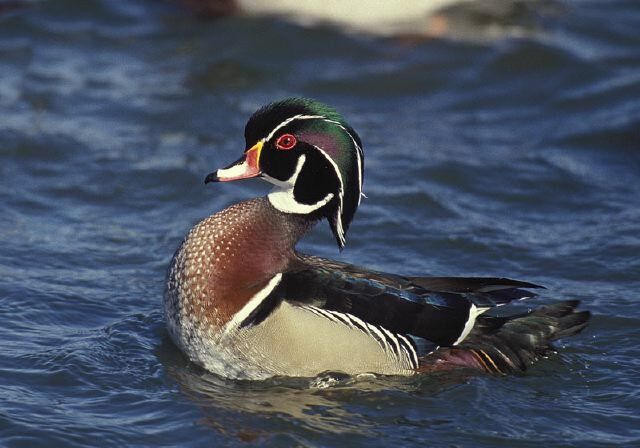 Wood ducks’ natural nesting cavities usually consist of a hollow nook in a tree, made over the years by a branch rotting away, or an old woodpecker feeding site. It also needs to be near water. Wood ducks are unique in that they are one of the only ducks equipped with strong claws on their feet enabling them to climb branches in order to build nests. 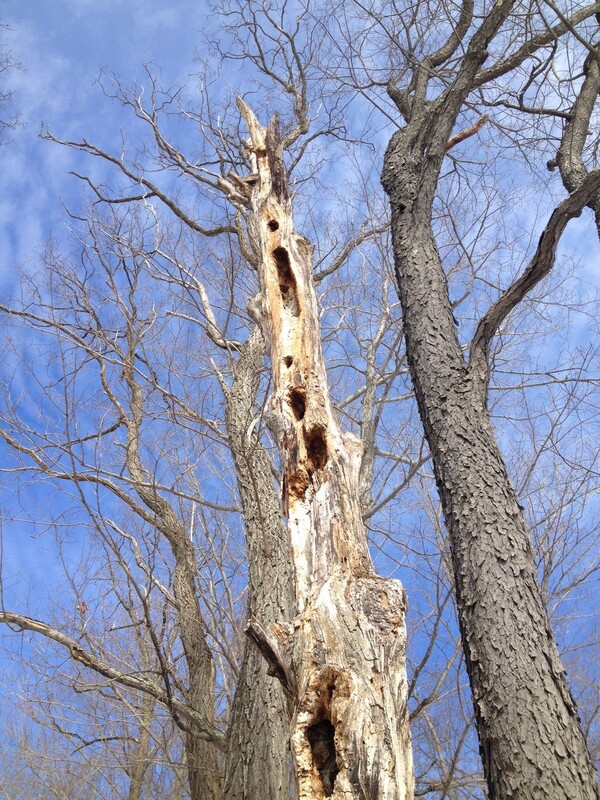 Because dead snags are seen as a danger to humans, the trees that wood ducks like to nest in are often cut down. Grafton Lakes State Park has so many bodies of water it is the perfect place to put up some nest boxes. Earlier this year we patrolled the 15 sites spread out over 5 ponds, cleaned out old nest material and refilled them with new wood shavings. If a duck chooses to use the box, the female will supplement the wood shavings with down feathers, and lay 6-10 eggs. Wood ducks have two broods each year. 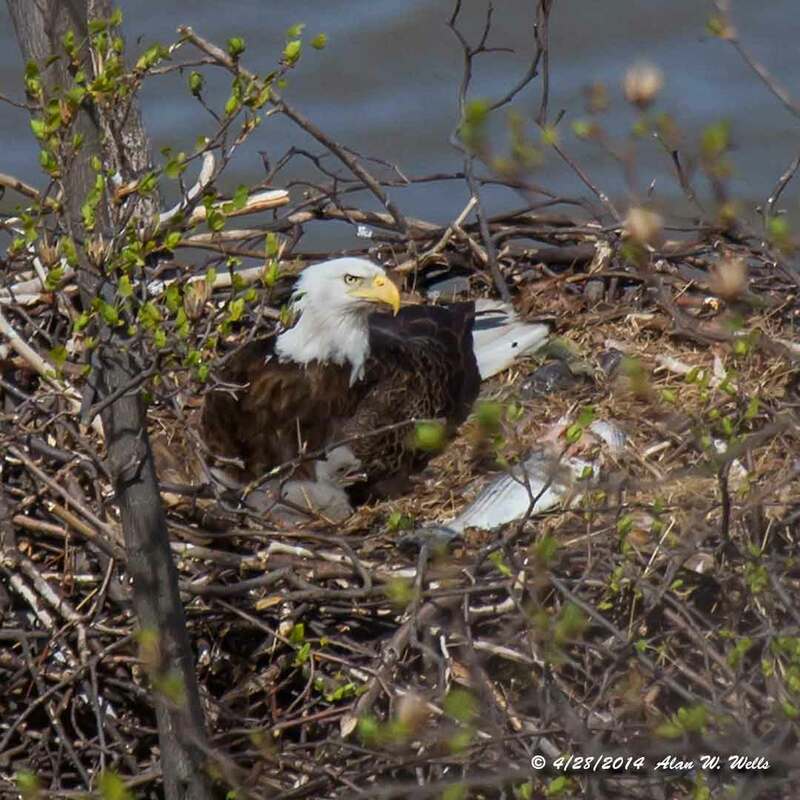 The chicks will hatch out in about 30 days with a full coat of down and are mobile within 2 days, jumping from the nest and waddling their way to the water. About 40% of the Grafton Lake boxes are occupied by wood duck broods each year, the rest used by owls, squirrels and other critters. The bluebirds face a different challenge- their populations have been impacted by increasing land development. Bluebirds need nests that are high enough to deter predators and enable them to look out on an open area where plenty of bugs can be found (like the edge of a farm field or large yard). 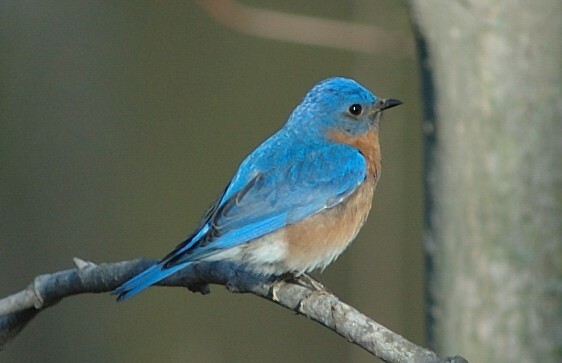 The other challenge to bluebirds is the increase of invasive species competing for the same type of nest. European starlings and house sparrows are both aggressive birds that will kill bluebird parents, chicks and eggs they find in order to claim a nest box for themselves. While starlings are not usually an issue with properly made nest boxes, the house sparrows should never be allowed to occupy a box. The Assistant Park Naturalists at Grafton held an educational program in the beginning of April about bluebirds. 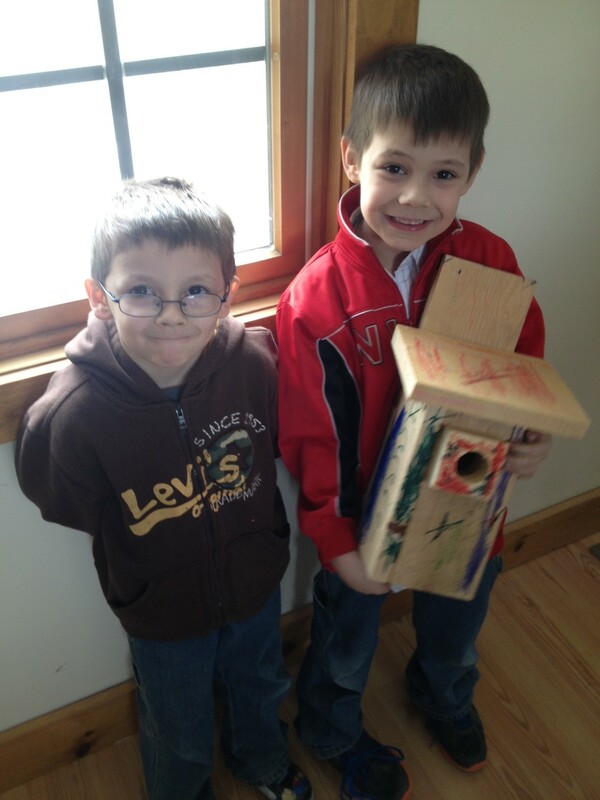 Almost 20 people attended; a lot of great nest boxes were made and brought home to spruce up personal yards. These bluebird boxes will become part of the successful citizen science project that has been helping bluebird population numbers rebound since the 1970s. Just a few days ago, the bluebird nest boxes at Grafton Lakes got their first check up. After knocking on the box to inform any birds of our presence, we checked for signs of nest building and cleaned out any bugs that had overwintered in the boxes. Bluebirds build their nests from dry grass or pine needles, and we did see both a partially constructed nest and one that was completed. Hopefully soon we will be hearing little bluebird voices in Grafton! If you’re interested in helping these beautiful birds there are many websites that have nest box instructions and dimensions for building your own box. Just make sure your box has adequate drainage holes, ventilation and weather protection. 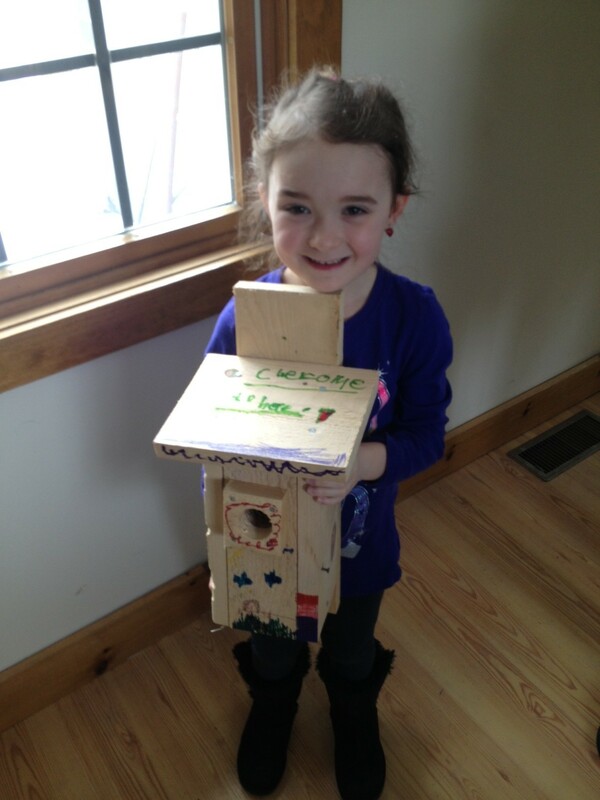 Put up a box this spring, grab your binoculars and settle in to see some amazing sights of nature in your own backyard! The Birders Report has a variety of nest box plans available including bluebird and wood duck boxes.